Search Results for "london financial"
LONDON, UK - 27 APRIL 2015: The skyline of London's business and financial district, Docklands. Canary Wharf (left) and Citi group tower (right) are visible against a blue spring sky. LONDON, UK - 27 APRIL 2015: The HSBC Tower, a key landmark in London's business and financial district, Docklands. LONDON, UK - 13 APRIL 2016: Time lapse 4K video footage looking over the corporate skyline of the financial City of London and Docklands districts on a bright spring day. LONDON, UK - 28 JANUARY 2016: The Bishopsgate area near Liverpool Street station in the heart of London's business and financial district. LONDON, UK - 28 JANUARY 2016: Rush hour traffic and pedestrians in the busy Liverpool Street area in the heart of London's business and financial district. LONDON, UK - 27 APRIL 2015: Video footage of rush hour commuters making their way across a pedestrian footpath into the London's business and financial district, Docklands, with the skyscrapers visible in the background. Aerial reverse tilt from cloudy sky to iconic London financial district skyline. London, United Kingdom. North bank of the River Thames, The City of London Financial District, night illumination, time lapse. 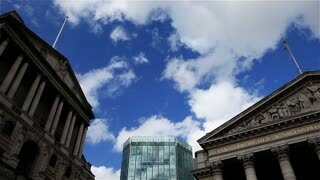 ZOOM OUT on a London financial bank with pedestrians and statue in foreground. Establishing shot of a London financial bank with pedestrians in foreground. River Thames looking towards the City of London Financial District with boats travelling on the water. Sunny, fresh day with clouds.